Rodeph Shalom Restoration | John Canning & Co. The historic restoration of the decorative painting on acoustic fabric at Rodeph Shalom required a conservation approach. Fabric was reattached and color matching was adjusted at each in-painting area to blend with adjacent colors. 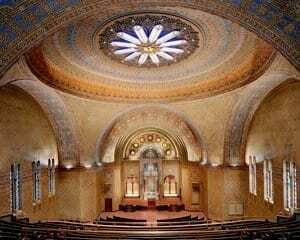 The decorative scheme spans solid and fabric substrates and carved wood framing the lay light at the domed ceiling center. The decoration was flaking on some surfaces, faded, and water stained. The fabric was ripped and torn in places, and discolored with soot around the HVAC vents. CLA conservators and decorators repaired the fabric, in-painted and replicated surface patterns, blending their work to match adjacent areas. 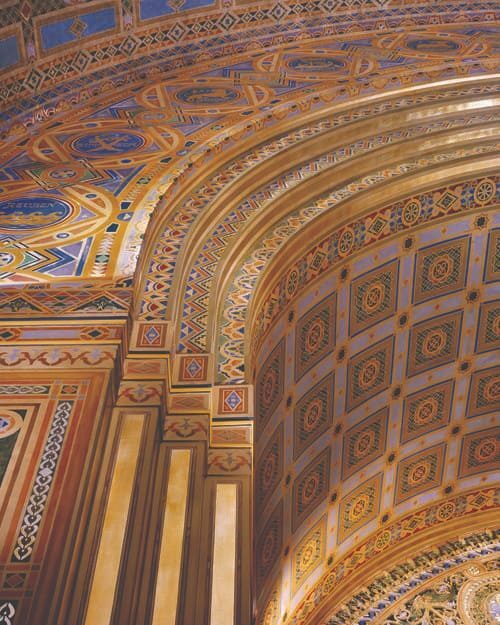 One of the largest and most complex liturgical decoration schemes we've worked on, the result was a satisfying, invisible restoration of the historic National Landmark interior.